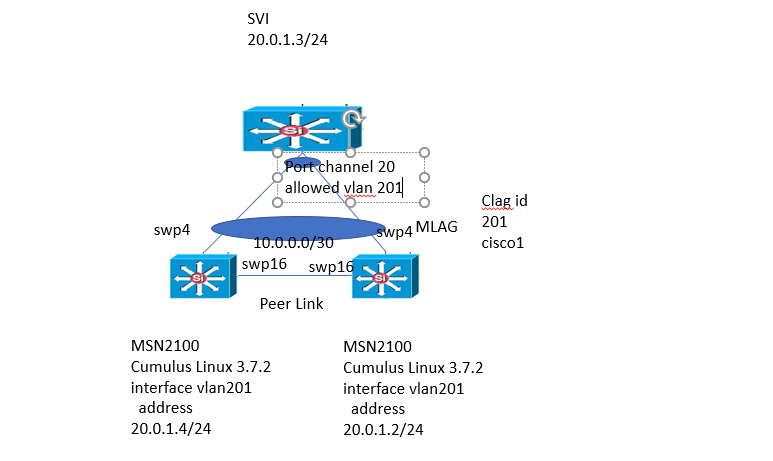 I am trying to create the VXLAN as mentioned below in the diagram..
but I am not getting the Ping between each other... can any one tell where is the mistake? Can you also provide the rest of the configuration? Is this in hardware or software, in case of hardware, which type of switches? This is an Hardware... its Mellanox SN2100 Switch..
Ok, how does the rest of the interface config look like? Between what are you trying to ping exactly? Typically you would setup a vxlan tunnel between loopback interfaces and also have a routing protocol in place. As you can see in the diagram its swp16 and its connected via 10G DAC cable..
how do I configure the loopback interface? and what kind of routing protocol? can you please share me the commands..? Please paste the output of "net show configuration". This will show the entire configuration (e.g the bridge, ports etc.) and not just the single vxlan interface. Between which two ip addresses are you trying to ping? It would help if you provide a bit more context on what you're trying to achieve. When building a vxlan overlay, you typically build an ip fabric and mostly with BGP. You announce the loopback address of a switch which will be the VTEP in the overlay network. When the tunnel is built you link it to a vlan and one or more physical ports where your servers are in. Please find my configuration file from below link..
kindly do let me know how I need configure or any mistakes.. I've looked at the configuration, but you have to provide some more details on what you are trying to do here. Where are the hosts connected that you are trying to ping between? I see that there also BGP sessions configured on SW02. Some neighbors are called "superspine". These are usually used in quite large environments. How does your topology look like? It seems that you have currently tied the VxLAN tunnel to vlan 300, but the port configuration on both is inconsistent (hence my first question). this is not a big setup... this is just we are trying out to create the topology for test basis..
My name is Sutharsan and I can assist with what you are looking to achieve. Let’s set up a call to look into this in more detail. I am in India at the moment. Is 1pm IST tomorrow a good time for a sync up? Please let me know your email address so I can send through an invite.